is on board the cruise ship, MS Normandie or MS Arlene II in a standard, outside-facing 2 bed cabin with private facilities and air-conditioning. 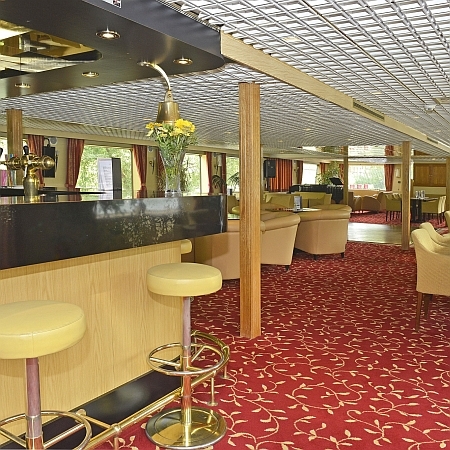 Standard cabins are situated on the main deck. Upgrade to an upper deck cabin available. Full details about the cruise ship MS Normandie including layout plans are avaialble here. Full details about the cruise ship MS Arlene II including layout plans are avaialble here.We are pleased to discuss details on request. 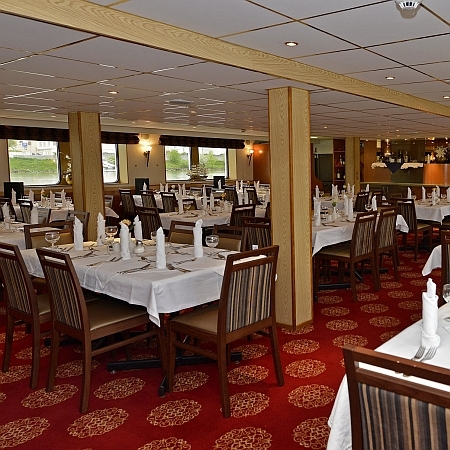 Please note featured images are of the MS Normandie. A wonderful way to see all the classic sites of the Austrian Danube including Passau, Linz, Vienna and the Wachau castles and vineyards. 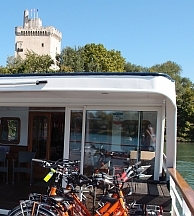 Pedal out from your floating hotel as you stop off on your cruise for easy day rides packed full of fab places to visit, then return to relax and literally watch the world go by as you cruise onwards to your next Danube destination. 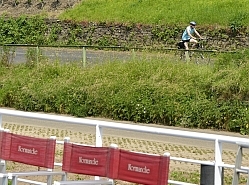 All cycling is optional, leaving you to explore the jewels of this awesome river valley up close, or simply sit back and watch the show from comfortable decks of the MS Normandie or MS Arlene II. Due to navigation conditions, the exact details of itineraries are confirmed daily at the morning briefing meetings. 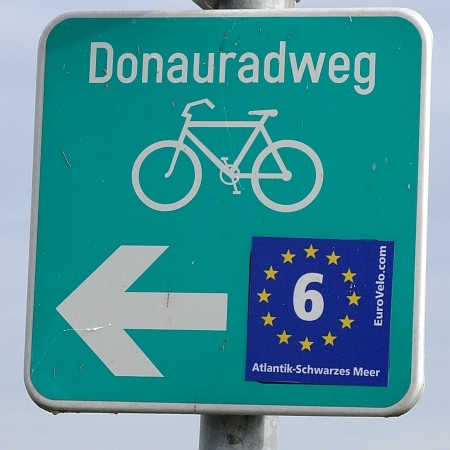 All cycling itineraries are optional. All overnights are on board your floating hotel, the MS Normandie or MS Arlene II and some overnights may include transit to the next destination. Day One – All aboard! 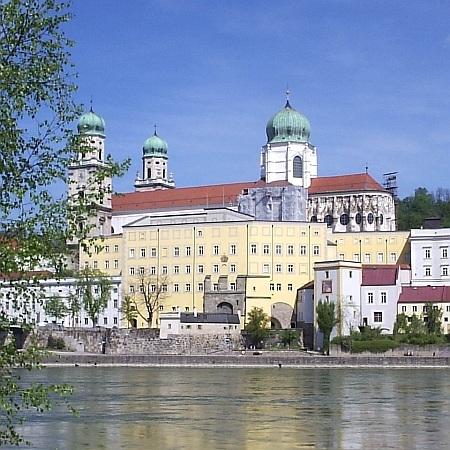 Explore Passau, the confluence of the rivers Danube, Inn and Ilz, arguably one of the most beautiful cities in Germany. Don’t miss the grand Baroque of St Stephen’s Cathedral with its massive pipe organ and the bishop’s former fortress, the Veste Oberhaus, sitting on the wooded crest between two rivers. Boarding time for your cruise and cycle adventure is 5pm with a welcome cocktail and dinner waiting for you in the early evening. Discover charming villages nestled in the natural landscapes of the Danube river valley around Engelhartszell and may be take in a visit to Austria’s only Trappist monastery. Stop for a sip of the special liqueurs and cordials prepared by the monks and reputed to have ‘healing powers’, or pedal back to the boat and prepare to drink in the views as the amazing, romantic Schlögener loop unwinds in front of you. After dinner, you may choose to take the CityExpress into Linz ( optional and payable locally) for an evening of bright lights and architectural treats in the capital of Upper Austria before returning to the MS Normandie / MS Arlene II for your next overnight. 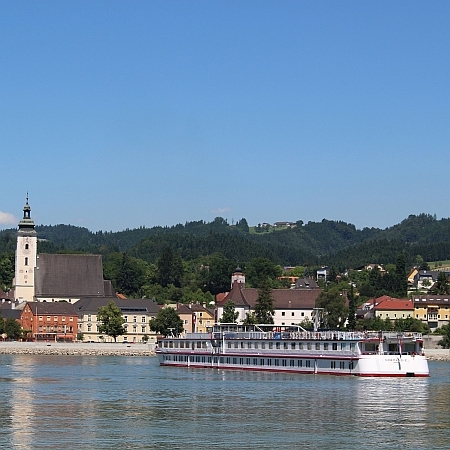 A cruise to Mauthausen in the early morning sets up a great day’s cycling, packed with culture and castles. Visit the very moving memorial at Mauthausen before pedalling on to the Celtic town of Mitterkirchen in the municipality of Perg, then choose to carry on coasting along the riverside, or to follow the slightly more energetic hinterland route into the beautiful ‘Strudengau’. Reaching the picturesque town of Grein, it’s hard to resist a visit to the solid, imposing Greinburg Castle built around 1488 and still the ducal home of the Saxe-Coburg and Gotha family. Return to the MS Normandie / MS Arlene II for your next overnight. A day of diverse landscapes starting at the Strudengau, one of the Danube’s narrowest points and then following the valley as it opens up around Persenbeug. Push your pedals a little further up to the amazing Baroque monastery at Melk next to the Wachau Valley. It was built into the rock by Leopold I on the site of Babenberger castle in 1089 and is the home to a Benedictine brotherhood. Back on deck, look forward to the sunset across the iconic Wachau Valley before the cruise stops at Tulln, famed for its market gardens and birthplace of the renowned member of the Art Nouveau movement, Egon Schiele. The sight of the cupola of the great Baroque monastery at Klosterneuburg announces that Vienna is not so far away. 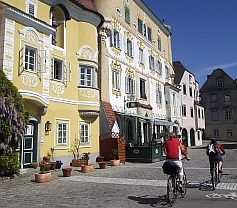 Set off to explore its nine hundred years of history or hop across from the shipping pier to Kahlenbergerdorf for a gentle tour around the vineyards and tempting time in the ‘keller- cafés’ or wine taverns. 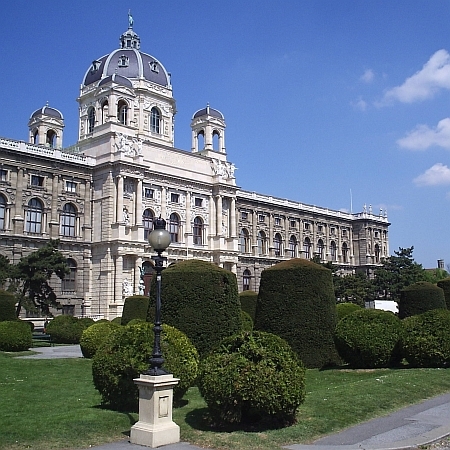 An optional bus tour (payable locally) is available if you prefer to head into vibrant Vienna and soak up the sights in advance of your own day of exploration. 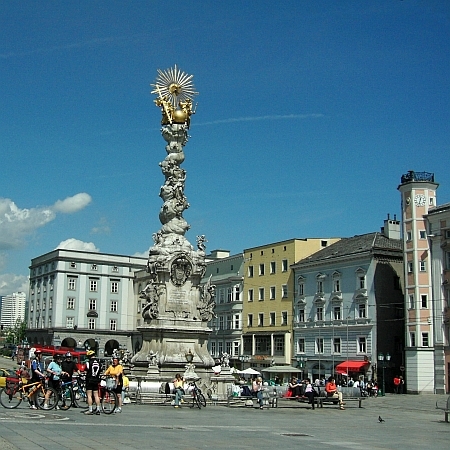 Enjoy a whole day in Austria’s magical capital. 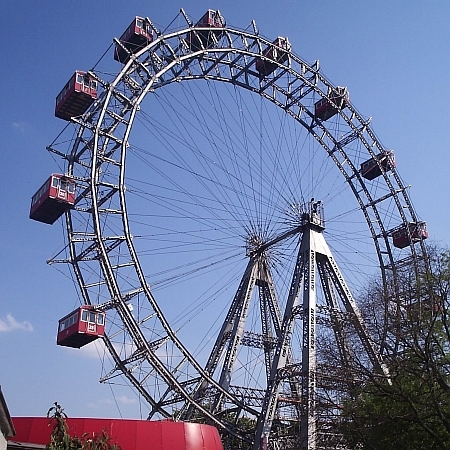 Start with a bird’s eye view from the famous big wheel or ‘Riesen Rad’ at the Wiener Prater perhaps to pick out all those must see attractions around the city. Don’t miss St Stephen’s Cathedral, the Romanesque Ruprechtskirche, Baroque Karlskirche plus Art Nouveau legacies and contemporary conundrums such as the eccentric Hundertwasserhaus. 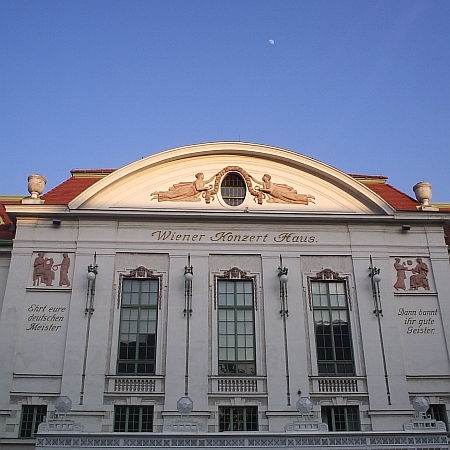 A guided tour by bike is available, so too an evening Waltz and Operetta Concert (both optional and payable locally) and there’s plenty of time for Kaffee und Kuchen in the finery of the smart coffee houses. Return to the MS Normandie/ MS Arlene II for your next overnight as the vessel moves on to Dürnstein. A day of enchanting landscapes with a rich crop of apricot orchards and vineyards, picturesque hillside villages and monasteries, captivating castles and impressive ruins. The small Baroque town of Dürnstein is overshadowed by the ruined castle where Richard the Lionheart was held hostage whilst returning from the Crusades; the blue tower of the monastery church here has become a landmark of the Wachau, a UNESCO World Heritage Site. Take time to reflect on the views and the vivid history of such an idyllic region with such a contrastingly complex past. Wind your way on to Weissenkirchen to savour the local flavours in a different way – at one of the many vineyard taverns lining your bike route back to the Danube and your floating hotel which awaits you at Pöchlarn. On board – evening farewell dinner and cocktail. 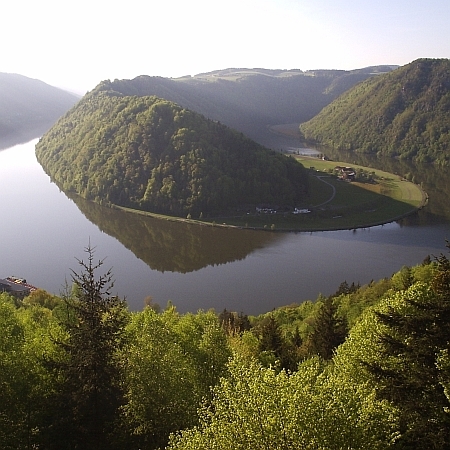 The great Danube carries you back towards Passau this morning, allowing you to enjoy one last glimpse of the ‘Schlögener Schlinge’, that mighty meander where the river meets the hard granite bedrock. Arrival back in Passau is around noon, so that you are ready for onward travel from around 2pm… but then, if you are still under the Danube’s spell, why not stay in City of Three Rivers a while longer? Extra nights can be booked to allow more time to explore Passau at your leisure. 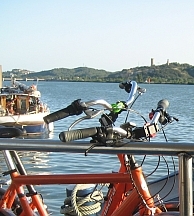 Price includes bicycles (discount given if not required) and port fees.